Just after the sun set I got up close to the moss growing on the wall of the well in my garden. Once I looked at the photo on my iPad and cropped the photo to show just the moss, I thought, in this light, these little plants with drops of water hanging from the ends of them, look like street lights! Red sky in the morning, shepherds’ warning. Know that old saying? The rest of it is “red sky at night, shepherds’ delight”. What the shepherds were saying was that when the sky was red in the morning there would be bad weather on the way. So, turns out red sky both in the morning and at night is “Bob’s delight”. I hope it’s yours too. From the plane window I saw the brightening sky before the dawn. Those deep contours in the clouds create such a strong impression of solidity, even though they are simply water particles hanging in the air. Now, as dawn breaks, it looks so familiar, and yet so different from the usual dawn, because it’s the sun breaking through between the levels of the clouds, not between the clouds and the surface of the Earth. I often take photos of the light, of sunsets, sunrises, of shafts of sunlight and of moonlight, but I don’t often take photos of artificial light. 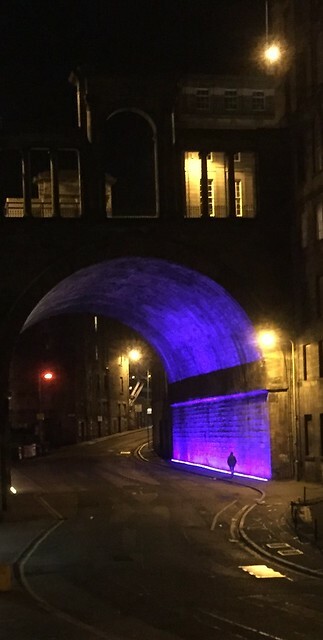 However, last night, in Edinburgh, I turned round and saw this……..I couldn’t resist. See how good an iphone shot can be? All I have done to the original image is to crop it. Yet again, photography is a vehicle for meditation and contemplation for me. The more I look at this photo, the more I see, and the happier I feel. In the A to Z of Becoming, C can stand for Choose. We choose all the time. Unconsciously. We choose what to eat, where to eat it, what path to follow to any particular regular destination (like the workplace), and so on, and on. Every day is filled with choices about what we want to put energy into, what we want to focus on, and what we want to do in the next minute. A lot of these unconscious (or minimally conscious) choices are created through habit. If you have ever attended a course or conference which runs over a number of days or weeks, you’ll have noticed how quickly people find a particular seat to occupy every day they attend. Most of our eating choices are largely unconscious. There will be certain meals you eat frequently, certain drinks you ask for in cafés, certain shops you shop in, even particular brands you stay “loyal” to. As I’ve written about other unconscious actions, there is nothing wrong, per se, in their being unconscious, but I find life changes when you make conscious choices. Making a conscious choice does not require you to actually make a different choice. You might still choose a particular beverage, a particular routine or whatever, but the deliberate act of bringing your choice to awareness and saying “I choose to do this” can be incredibly empowering, affirming, and heighten your experience of whatever you have chosen. Bring some of your routines and habitual choices up into your consciousness this week, and either actively choose to stick with them, or choose an alternative. I think it is often difference which catches my eye. i think difference is beautiful. Sameness quickly becomes, well, sameness. This simple photo is beautiful, not just because the blue sky is beautiful, and the yellow lichen on the tree is beautiful, but also because of the contrast between the blue and the yellow, and the contrast between the smoothness of the sky and the roughness of the branches. Mass production and mass control seems to have a different ethic from this – uniformity and the “elimination of variation”. Here’s to a celebration of difference, of uniqueness and of diversity. One of the keys of my approach to life is a phrase I encountered in a French book – “l’émerveillement du quotidien” – meaning, the amazing wonder of the every day. 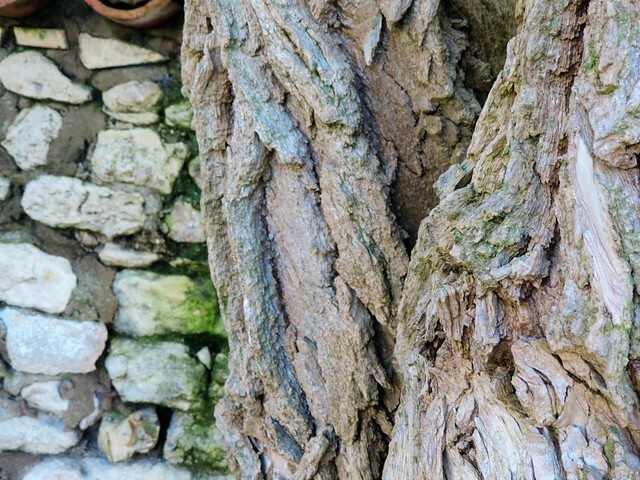 Look at the incredible texture of the bark of the tree, and the way it plays in relation to the dry stone wall behind it. Found an amazing textures today?